Often imitated, but never duplicated, L.L.Bean duck boots have been customer favorites since 1912 when our founder, Leon Leonwood Bean, returned from a hunting trip with cold, wet feet and a revolutionary idea. By combining rubber bottoms with soft leather uppers, he created a waterproof, non-slip boot like no other. 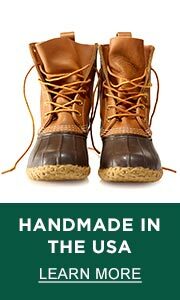 Today, our legendary duck shoes are still handcrafted here in Maine, one pair at a time. Over the years, our line up of Maine duck boots has grown to include a range of performance features like Thinsulate insulation for winter warmth, cozy shearling and waterproof Gore-Tex linings, all with the same unmistakable quality as our original L.L.Bean Boots. While many duck boots on the market might look similar to L.L.Bean Boots, they lack the attention to detail and the premium-quality materials that have allowed ours to stand the test of time.